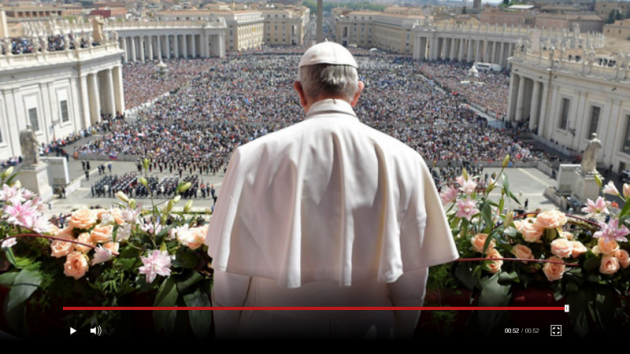 (Screenshot from BBC)Pope Francis delivering his 2017 "urbi et orbi" address on East Sunday, April16, 2017. Pope Francis has called for governments around the world to collaborate to make migration a safer and voluntary choice, arguing that assuring food security for all requires tackling climate change and ending conflicts. He made the call at the global ceremony to mark World Food Day, held at the UN Food and Agriculture Organization headquarters on Oct. 16. This year's theme focuses on addressing migration through investing in food security and rural development. "It is clear that wars and climatic change are a cause of hunger, so let's not present it as if hunger is an incurable disease," Francis said during his key note address. He called for a total commitment to gradual and systematic disarmament, and urged a change to lifestyles, the use of resources and the production and consumption of food to protect the planet. He spoke about the development of the Global Pact for Safe, Regular and Orderly Migration - the first agreement of its kind being negotiated by governments under the auspices of the UN. 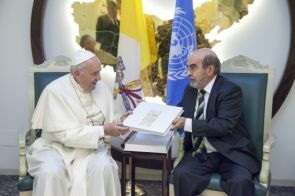 (Photo: FAO)Pope Francis and Food and Agricultural Organization director general,José Graziano da Silva, at the FAO headquarters on World Food Day 2017 in Rome. "Managing human mobility requires a coordinated, systematic intergovernmental action in line with existing international norms, and full of love and intelligence," said the Pope. "What is at stake is the credibility of the whole international system," he added. Without naming any specific county, the pontiff said it was unfortunate that "some" countries are moving away from the Paris Agreement on climate change. This was believed to be a clear reference to the United States, which pulled out of the agreement June 1 as President Donald Trump announced the U.S. would pursue other means of addressing the environmental issue more favorable to American interests. Each year millions of people leave their homes to escape hunger, poverty and conflict. "More and more people migrate because they do not have the option to remain in their homes and lands," said FAO Director-General José Graziano da Silva. "It is our intention to address the root causes of migration, such as poverty, food insecurity, inequality, unemployment and lack of social protection. "To save lives, we need to rebuild the environment in which people live, reinforcing their resilience and ensuring their livelihoods to offer them the possibility of a dignified way of life," he said. World Food Day is being marked this year as global hunger rises for the first time in over a decade, affecting 815 million people or 11 per cent of the global population. The increase is largely due to the proliferation of violent conflicts and climate-related shocks which are also major drivers of distress migration. Madagascar President Hery Martial Rakotoarimanana Rajaonarimampianina, whose country is facing the impacts of climate change, also spoke at the event. "Young men and women are the most affected by (climate change-related) population displacements. If we want to change the paradigm of migration, we need to find solutions in the countries of origin," he said.